The Van Gogh-Goghs » Blog Archive » Happy Easter! « Come on, Internet, be our Valentine! So lose the pants! 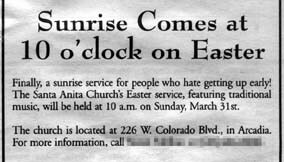 Because if there’s one thing Jesus understands, it’s how hard it is to get out of bed on the Sunday after Good Friday. Am I right, people? Go ahead, sleep in. How much different does the sun look at 6am than 10am? Besides, it’s Easter it’s not like there are gonna be presents or anything. Maybe some candy and eggs, but nothing cool like a racing set or a Barbie. This entry was posted on Saturday, March 22nd, 2008 at 12:51 pm	and is filed under Holidays. You can follow any responses to this entry through the RSS 2.0 feed. Both comments and pings are currently closed.